Please join us on Thursday, July 12 for the annual Parade golf tournament. 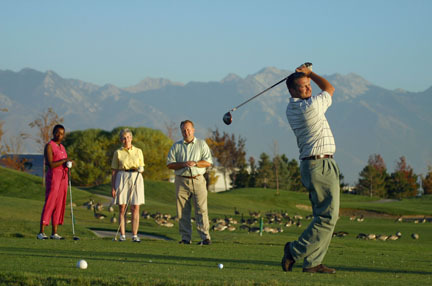 This year we will be playing at the Eaglewood Golf Course, nestled in the hills of the Wasatch front. Each hole of this par 71 course has its own personality in this mountainside designed course. Moose, deer, red foxes and coyotes make regular appearances on Eaglewood’s terrain, and bald eagles soar high above the links. Your entry fee will include the practice range, green fees, cart, golf shirt (both men’s and women’s styles), and lunch after the tournament on site, during which time the scores will be posted and prizes awarded. If you wish to rent golf clubs, they are available at the course for $30. As always, you may arrive early on tournament day to use the practice range. You will be pleasantly surprised at your improved golfing ability because the course is well above sea level and your golf shots will fly farther! At the time of registration you may request to play with specific players and that request will be honored if possible. You will also be asked what shirt style and size you want and if you want to rent clubs. I hope you decide to participate in the golf tournament. You don’t have to be a good golfer to enjoy playing on a team with old (or new) friends, and being in the outdoors with beautiful scenery and having a good time! Please join us! If you have any questions, please contact me.